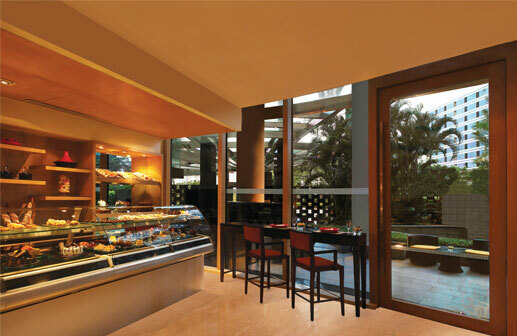 Our patisserie offers casual, fun dining at its best. From a delicious selection of fresh bakes, artisanal bread and chocolates to gourmet sandwiches and salads, the patisserie is perfect to eat-in or takeaway. Our pâtissier would be happy to customise a cake or dessert for special occasions, like birthdays and weddings. The patisserie also offers a host of gourmet gift items for a business associate, or simply as a souvenir of your stay with us in Bandra Kurla Complex, Mumbai. Trident Patisserie & Delicatessen is open from 8am to 8pm. Monday to Saturday : 8 a.m. to 8 p.m. Whether you're gearing up for a day of work or relaxing, you'll love the delicious variety of bespoke cakes and pastries at Trident Patisserie and Delicatessen. Our team of chefs delight in preparing elaborate cakes and desserts to order. Delicately handcrafted using the finest of ingredients, our artisan chocolates are miraculous works of art that will seduce your palate and uplift your soul. Create your own meal by combining any sandwich, salad and beverage of your choice at some truly unbelievable prices!